"It's really gut-wrenching ... The manufacturing processing of food in Australia is just buggered ... The government should be looking at it because we all can't work in a service industry". 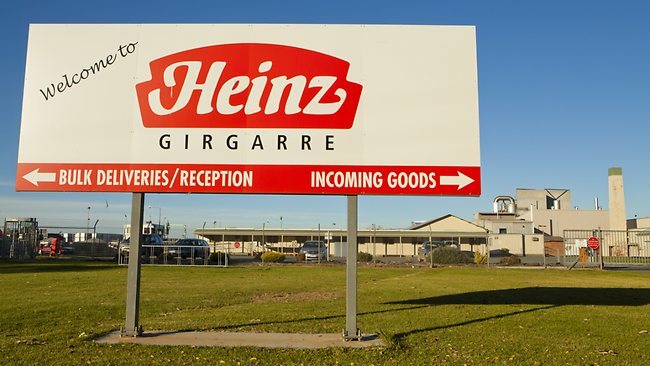 HEINZ will no longer make tomato sauce in Australia leading to the loss of 146 jobs when it closes the doors on a factory in Victoria's north... before moving sauce production to New Zealand. ... the redundancies represented the continuation of the Goulburn Valley's hard-luck story. About 150 workers also lost their jobs when SPC Ardmona closed a fruit cannery in September last year. Hey, Prime Minister Julia Gillard! Hey, Trade Minister Craig Emerson! Anybody home? Are you OK with more jobs going overseas? Is there any trace of intelligence or conscious left in your brains? Anything at all? Yoohoo? Anybody home? Knock knock? Wakey, wakey. Oh, stupid me, what was I thinking? Of course we are just "transitioning" to more competitive industries in the new Asian Century. Silly me. At ease people, the ship is in good hands. The captain knows exactly what she's doing. Yep, we're moving forward. Forward to where you ask? Oh don't ask such silly questions, Labor is the progressive party so they must have a good answer. Surely they do. I don't know what it is, but I'm sure they know what they're doing. Yep. Oh, that's right, I forgot about Gillard's master plan: "There is a simple equation at work here: trade equals growth, equals jobs". Phew, I'm glad it's so simple, I was getting worried there for a minute. File under: the gut-wrenching and brain-dead ideology of free-trade strikes again.